I continue my series of scribal interviews with Master Giles de Roet of the Kingdom of Lochac. I first "met" Master Giles on Facebook via a couple different SCA Scribal Groups. 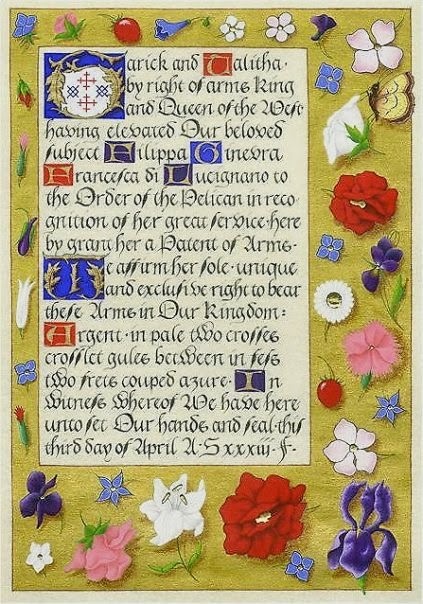 When he posted the image of the Laurel scroll he did for Filippa da Lucignano, inspired by the Prayerbook of the Emperor Maximilian, my lower jaw nearly dropped off my face. It, along with some additional stunning examples of his work, are included with his interview for you to drool over. After I posted my interview with Ian, Master Giles replied and offered to be another victim, er, interviewee, and for that I am extremely grateful. I found his answers to be quite educational and inspiring, and I hope you will too. Thank you Master Giles for sharing this with us. Tell me a little about yourself and how you first got involved in the scribal arts in the SCA. Did you have artistic experience prior to this involvement that has helped you? 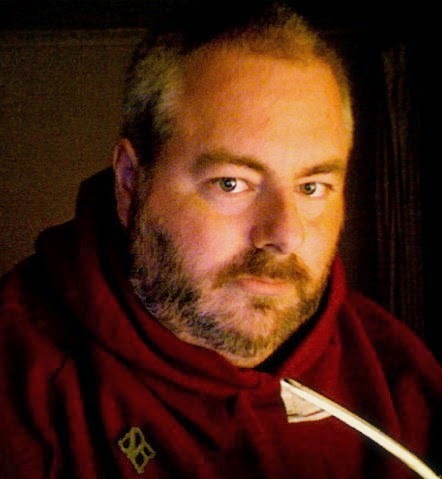 I'm Master Giles de Roet, a scribe in the Kingdom of Lochac since 1983. I discovered medieval calligraphy more or less by accident, when I was given a history book that featured a magnificent page from the Winchester Bible. I 'borrowed' a cartridge pen to see if I could make letters like that, which seemed easy enough. I found the SCA the next year, and thus my fate was sealed. Over the years my projects have included introducing period documents as an option for SCA scrolls, bookbinding, making ultramarine from scratch (never again) and painting period banners and parade shields. From 2000-2004 I served as Provost of the Scribes' College, and expanded it into a Royal College and Fraternity, structured after a late medieval guild. Mundanely I study medieval art academically; I've also given museum lectures on Irish manuscripts, and the tools and work of the medieval scribe. When I started, I had no artistic experience or education to draw on - in fact my one and only formal art lesson didn't come until 2004. For that matter, there were no other scribes in my area, and the only scrolls I ever saw were infrequently at events. I had to get literally everything from books. My teenage years were spent obsessively sketching marginalia, botanical studies and da Vinci drawings, until unwittingly I had taught myself to draw and paint. The take-home lesson from that, of course, is that there are no better teachers than the originals. 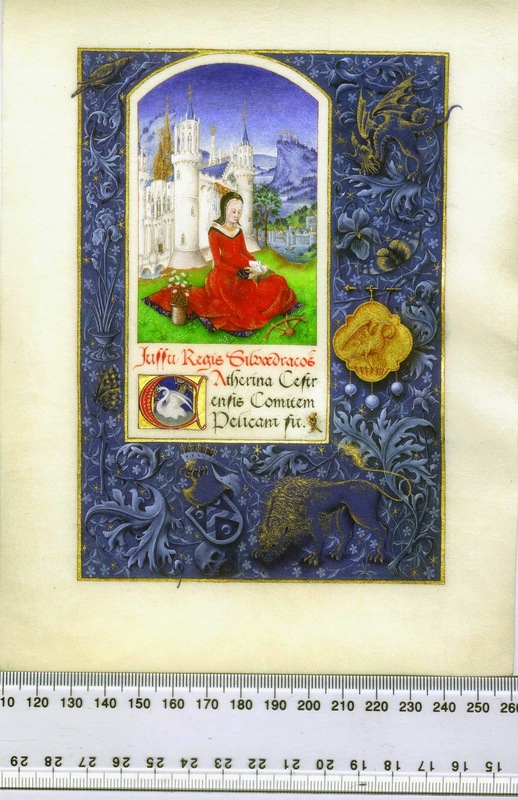 Look at as many manuscripts as you can, immerse yourself in medieval art, read period craftsmen's manuals. Follow their example and you won't go wrong. Hours, Flemish (Ghent-Bruges school), c1475. Are you primarily a calligrapher, or are you more well-rounded, also painting and/or writing words? 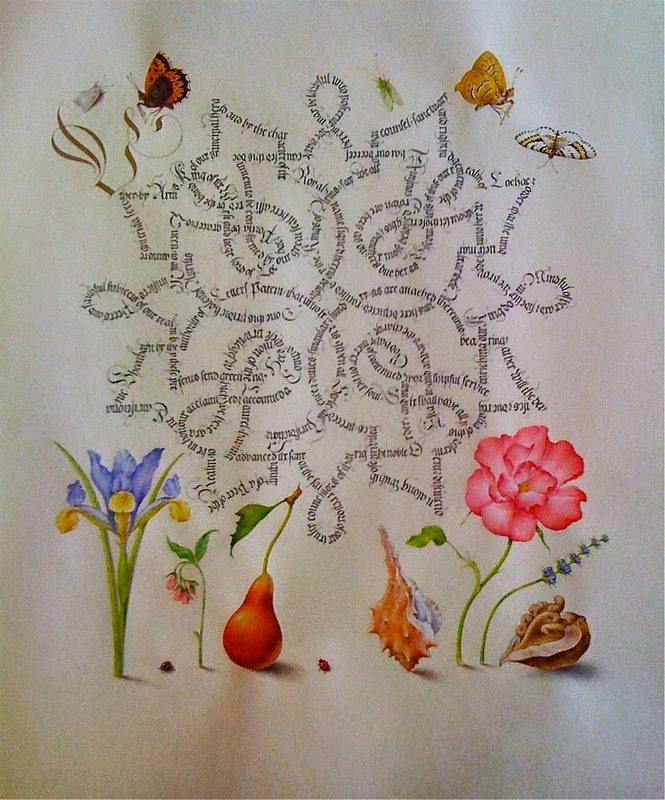 I do everything; design, calligraphy, gilding, illumination. I also write my own texts based on period documents including several in medieval Latin for added authenticity. What is your favorite "everyday" combination of paper, ink & nib(s)? Parchmentine [Another name for Pergamenata. -Alexandre], Chinese lampblack ink, goose quill. Do you have any other tools or materials you can't live without? 000 genuine sable brushes. Expensive, but essential: the difference between driving a clunky runabout and a German performance car. 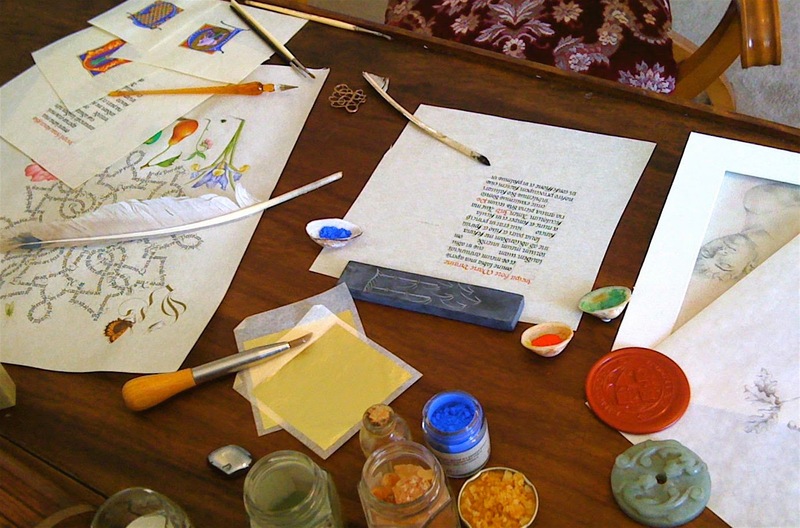 What does your calligraphy workspace look like and why? My scribal desk is an antique clerk's desk from England c1860 that I've had for a decade, made from solid cedar so it weighs a ton. It is 1.25metres wide so it can take charters easily, and has a sloped lid that makes calligraphy easy. The deep tray under the lid and built in locker holds all my art supplies. It sits under a large, south-facing window so gets lots of natural but indirect light, and I keep a flexible lamp with a daylight bulb on the shelf above the writing slope. This is a staged promotional photo, but apart from the finished pieces nearby I try to work with the desk and workspace in a similar (relatively)tidy fashion. When working I have several sheets of paper under the scroll, and tools (pencil, eraser, penknife, brushes, burnisher) set out to my right. My modest collection jade seals that normally adorns the desk also serve as paperweights for reference sheets. When painting I have the shells and palettes to hand, and I often put a dab of blu-tak on the bottom of the shells so they don't slide all over the place or slip off the writing slope. I used to obsessively tidy everything away at the end of every day, but eventually laziness won out over OCD. Do you have a favorite or preferred script, and why? My hand gravitates toward a batarde script similar to Nicholas Spierinc, or an ornate Fraktur inspired by Georg Bockskay. I like that they are recognisably 'medieval' but add an extra layer of sophistication and decorative quality. Having said that, I also enjoy Merovingian scripts like Luxeuil and Orgeuil that exploits the same decorative habit. It takes rather a lot to get me near an Italian humanist hand. Bor. Ing. Petrarch's Trionfi by Bartolomeo Sanvito, Italian, 1515. When you have a scribal assignment, what is your process? My process has changed quite a bit over the years, as Lochac grew from a Crown Principality of the West to a fully-fledged Kingdom. When taking an assignment, first thing is always to check that the details of the recipient's name and award details are correct, and that you know what the arms looks like. Today that's a breeze, just few moments online checking Canon Lore (the awards database) and Lochac Roll of Arms. Remembering what a laborious process this was cross-checking paperwork even ten years ago, I'm always deeply grateful that it's so accessible today. In the past, I would then look up the standard wording in the West Kingdom scribal handbook, and write it out with all the information inserted as the text to copy. I would also make note of what armorial accessories (helm, mantling, supporters) were permitted to the rank of the award. Next, I would put together a kind of collage of elements- capital, decoration, seals, shield and armory, etc. I would trace or photocopy various elements and literally move them around until everything fit. I would then draw the design and write the text in full, on 'ordinary' paper, sometimes several times. Sometimes I would colour it, other times I would make notes as to colours. Only after all that would I write the text on good quality paper; if I made any mistakes I would discard and start again. I would always try to do the calligraphy in one session to ensure the hand was consistent, even though sometimes that took one or two entire days. Today my process is quite different, mostly the result of experience. I will tend to select an assignment with a style in mind, that will fit the recipient's tastes certainly, but is also something that I will get satisfaction doing- be that because I enjoy the style, want to try something new, or want to make something uniquely tailored to the recipient as a mark of special regard. After checking the details are correct, the next step is to write a text appropriate to the style. Although we still have the option to use a set text, I have always loathed standard SCA texts as restrictive, overblown, full of appalling grammar and reeking of a historical cognitive dissonance. Writing a tailored text based on period documents can circumvent many problems, and convey the necessary information in a much less intrusive and far more authentic way. Although period Grants and charters can be extremely lengthy, having done one of authentic length I'm now very much aware that I'm the mug who has to write all that out, which helps reign it in. I find for a charter style award scroll, between 5 and 10 lines is plenty; for an illuminated page style, I try to keep the text to a minimum. These days I won't print or write out texts overmuch: I found that habits such as obsessively writing out text and even measuring out where individual words started resulted in rigid work that I often made mistakes on because I was more obsessed with spacing than with writing. Today, I make a conscious effort to work as period scribes did, by leaving spaces for versals and illuminations, and letting the script fill the space organically. Where problems arise, period solutions present themselves- hyphens, broken words, and contractions. With only a little judgment surprisingly few are needed, and I will sometimes sketchily pencil in the word to see what might work best. Even more surprising is that readers adjust to this automatically, and barely notice. I find this helps my script be more consistent, and with those period fixes, look more authentic. Once the calligraphy is done I will check back over for any errors, which I can then touch up, or scrape out with a scalpel blade when completely dry (usually overnight). I use a curved scalpel blade with a point, like many period pen knives, and this point lets me make pinpoint corrections. At this point I also erase any pencil lines using a soft plastic eraser. I've found it's essential to clean the eraser a few times, as graphite smears on parchmentine. I then come back and add in any cadels, versals or rubrication, and then the primary capital, if not 'fully' illuminated. Next is the illumination. The exact approach is going to vary from style to style, but again, I make the conscious effort to work as period illuminators did. That's still very broad, as some illuminations were barely sketched before being painted, and at the other end of the scale vignettes (as borders were called) and miniatures were fully worked out stock patterns from model books. The best approach is to look at examples from the period you're doing, and break it down into its components. I often start with the capital, even if it's not always the first thing I paint; as a relatively small but important design element, it helps set the tone or add an interesting contrast to the rest of the illumination. If the capital in the exemplar is at all appropriate, I'll often adapt it. If I don't like it, I'll look around for something that fits either stylistically or within the time period. A recent example was adapting a zoomorphic capital to a 1440s English charter. Although the style originated in 1390s Italy, similar capitals were found across Europe into the 1460s- and with just a couple of minor tweaks to the style of armour and by rendering the capital in grisaille, it matched the period and existing grisaille 'ribbon' letters very well. Charter of King's College, Cambridge, 1446. One thing I try to be aware of in illumination is parergon, the medieval habit of telling a 'hidden' or second-layer story with design elements. For example, I made the zoomorphic capital described above using a knight, a hound and a pelican in its piety: chivalry, fidelity, and self-sacrifice, the qualities of the Pelican (and a good way to work in the symbol.) 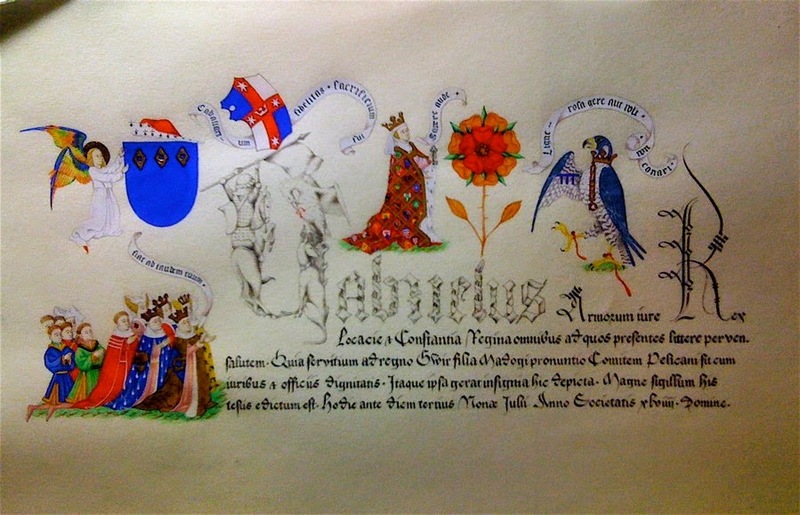 On that same scroll is a peregrine falcon, a carved rose, and various nobles in heraldic cloaks kneeling behind the owner. An outsider would see heraldic designs: the recipient will see her son, her household, and her community that supported her through her husband's illness and passing. 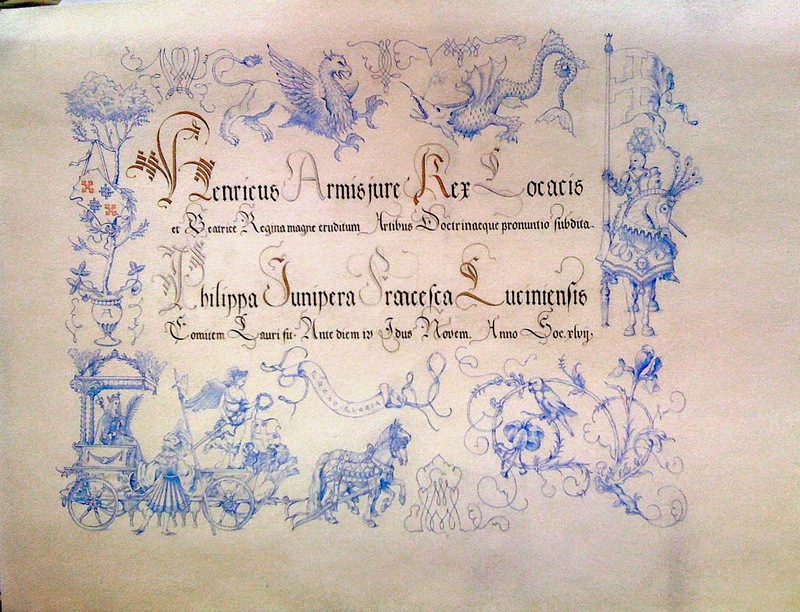 On another scroll based on the Mira Monumenta Calligraphiae, I chose fruits and plants that echoed the recipient's skill in cooking, and emblems of the cities where she lived in Lochac and Drachenwald. A casual viewer would see a botanical display: the recipient sees her journey to the Laurel. A little forethought can add a subtle and uniquely personal dimension to a scroll. Like the calligraphy, I try to let decorative elements evolve within the overall design. I find sketching elements on translucent architect's drafting parchment lets me build up layers, and make needed adjustments to any element. I try to keep the design and sources as consistent as possible, which helps the elements form a cohesive whole that looks like areal medieval manuscripts, not a TSCA pastiche. That's not say illumination should be a slavish copy, far from it. To me, the point of creating a medieval work of art is emulating and learning the distinct visual language of medieval art, and the processes that go into it. Once you understand that language, you can innovate and articulate a personal style and verve within it, just as period limners did. If you're not doing that then you're simply not doing period work, as an artist or a scholar - which is the entire point of the entire exercise. On that point, one thing I hate is the TSCA 'portrait' of the recipient kneeling before the king, receiving their award. I know lots of people love it, but it's twee, it's intrusive, it's unhistorical, and it's lazy. What I try to do is subvert that idea using a more historical approach: the recipient kneeling robed in the mantle of their Order, for example, or presenting something to the king or group. To me, good illumination finds period ways around intrusive modern/TSCAisms. The same goes for huge modern-style heraldic displays. They flat-out aren't authentic, even in period Grants of Arms. Instead, I look for ways to use the heraldic elements as they used in period manuscripts. It may not be possible in a Kingdom with strict rules about heraldic display, but Arms don't have to be huge, or on clunky heather shapes, to be effective. Once the design is done, I start with the gilding. Doing this first ensures no gold flecks get caught in paint, which can be difficult to remove. I then move on to the colours. I don't work light to dark or anything, but again I do try to follow the medieval illuminators' method: backgrounds, figures, details, faces. Although honestly, I often cheat and do the faces first, so I will be less frustrated if (when) I make a hash of it. Again, it helps to give some thought to colours, and how they were used in period- which is not necessarily how a modern eye would use them. I keep my pigments in sea shells, and mix them on a modern plastic palette (never in public! ), on an off cut of parchmentine, or if non toxic or gouache, on my palm, as the Gottingen model book suggests. Only for the brave with paper towels at the ready. I always try to photograph the finished piece, including close-ups of detail areas, to keep as a record and show off on my web and facebook pages. What are your favorite calligraphy books? 'Medieval Illuminators and Their Methods of Work', by Jonathan J. G. Alexander, is a fascinating insight into how manuscripts were made and why they were made that way. It shows different tools and techniques, and some background on the work and social status of scribes in the middle ages, as writing evolved from a monastic to a secular profession. As far as how-to books go, when teaching I often recommend 'The Illuminated Alphabet: An Inspirational Introduction to Creating Decorative Calligraphy]' by Timothy Noad and Nora Seligman, which gives an excellent grounding in illumination techniques - which is where so many beginning limners get lost, illumination is NOT the same as modern acrylic or watercolour techniques. This book will take a budding illuminator a very long way. Finally, one of my most treasured possessions is a hand-made replica of the Gottingen Model Book, a 15th century illuminators handbook that features instructions for tempering colours and step-by-step illumination instructions. Do you have any recommendations for books or websites full of inspiration for future projects? Erik Kwakkel's tumblr http://erikkwakkel.tumblr.com is pure scribe candy for hardened junkies. 'Codices Illustres: the world's most famous manuscripts', by Ingo Walther (Taschen) is also a lavish and very enjoyable resource, and an ornament to any coffee table. of the Emperor Maximilian, illustrated by Albrecht Durer, German, 1514. What's the best part of being a scribe? The reward of carrying on and rediscovering a tremendously rich part of our cultural history, the satisfaction is mastering a difficult technique or ambitious design, the pleasure of knowing it will bring joy to someone deserving. That so few people grasp the amount of work, research and monetary value, from hundreds to tens of thousands of dollars, that each scroll represents. It's very hard seeing that dedication and generosity taken for granted. What advice do you have for beginning calligraphers? Don't be daunted. Don't feel overawed by magnificent scrolls, they are a matter of experience, practice and patience. Don't be scared of trying period tools, you will come to handle them easily very quickly. Don't be afraid to pursue the aspects of the scribe's art that interests you, whether that's painting pretty borders or delving into their complex history or meaning. Don't be discouraged by mistakes, use them as a spur to keep practicing and improving. Never stop practicing. Practice your lettering, practice your painting technique, practice your drawing skills. Don't forget that da Vinci was a beginner once, too. Do you have a gallery or website showing any of your work? the Bold f22v (Christ Appearing to St James the Greater), Flemish, 1469.